There's a new app. slated to hit the market in March. The app. 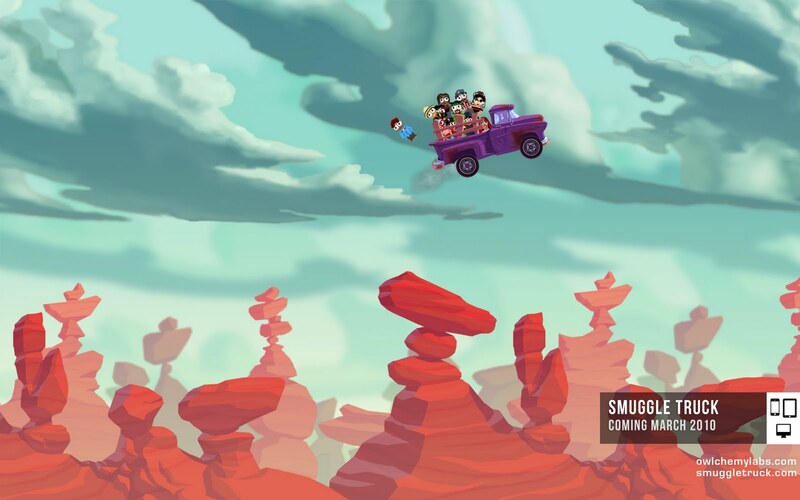 will initially be available for iPhone and iPad users and is titled "Smuggle Truck: Operation Immigration". The application itself is a sign of our times; a polarizing satire of one of America's biggest dilemmas: illegal immigration. The object of the game is to safely transport illegal immigrants through the desert and avoid losing as many as possible. Immigrants fly out of the truck as it encounters problems and maneuvers through various hazards. Green Cards are granted for the safe delivery of passengers as well. The game has garnered popular feedback in field testing by techies and has been compared to the ultra popular "Angry Birds" app. However; many immigration proponents, human rights groups and Latino activists are outraged by the app. Eva Millona, Executive Director of the Massachusetts Immigrants Refugee and Advocacy Coalition had the following comment: "Last year, 170 human beings died crossing the border, it's disgraceful that anyone would try to make money out of this tragedy by making light of it in a game." The Director of Centro Presente, a Somerville, Massachusetts-based Latino immigrant advocacy group followed up, saying, "I don't think that people who are trying to emigrate into the U.S. think they are part of a game, they do it because they are desperate." Smuggle Truck, Operation Immigration developer Alex Schwartz of Owlchemy Labs maintains the idea for the satirical game came out of frustration friends faced while trying to immigrate to the U.S. and the creators of the game have a variety of animated characters, most of which don't fit into the stereotypical illegal desert border crosser. To further illustrate this, the game goes as far as featuring a space alien character. Smuggle Truck arguably takes a cavalier approach to the immigration issue, in fact, designers admit they would not have designed this game for a mainstream system, and thus chose to introduce it as a smart phone app. One thing is for certain: the game illustrates the division that separates many Americans on their views of illegal immigration and it also sheds light on the complex problem that our government has created, nurtured and allowed to proliferate through their gross negligence for so many years. I think the game is quite funny and looks like a blast. It kinda makes me want to get a smartphone, but that's another issue in itself. One thing is certain -- I do not think that the immigration problem in our nation is funny. I think that illegal immigration is a contagion in the United States and its true cost to America is tough to gauge, though its often understated by the media and politicians. Blame is easy: I blame our government, the Mexican government and some businesses that take advantage of cheap, illegal alien labor. However, blame offers no solution -- I think we need to start enforcing current law while auditing the current immigration system, and begin formulating reform to update and improve the ways that people can legally immigrate to the nation. The problem will likely take years to solve. I think there will be much overreaction to the Smuggle Truck, Operation Immigration app., which, at the end of the day, is just a game. Perhaps those so outraged by a benign, if not politically incorrect smartphone app. will actually consider viable solutions to the complex problems that mass illegal immigration causes...what are your thoughts? I think the field is ripe for other games: I could certainly see a "homeland defenders" castle-defense style game, where you place militia members at key points to snipe illegals crossing the border, while trying to gather enough money to build more permanent automated defenses. You could have a meta-game where you need to split money between funding the defense, and lobbying your own liberal government to reduce the constant dismantling of the defenses. You could also make a first-person shooter where you are a lone defender, fighting off drug smugglers trying to take your land by force, while avoiding the FBI who will arrest you for defending it if they run into you. At first, I laughed at the video... But it really isn't funny. Just another sad problem in our nation. There will undoubtedly be a sequel to this smash hit. I can't help but find the humor in the game. I never get my blood pressure up for things of this nature, its the reality their based on that really gets me mad! I think it’s a shame that these people are making a $killing$ with this issue. An iPhone game that glorifies the fact that people die while they search for a better way of life? GIVE ME A BREAK! But as bad as this seems, this game is not the first one creating all this controversy. Last month the very first "controversial" iPhone game was released, the one who started this entire dilemma, JOSE COMES TO USA.